Ubuntu Touch 14.10 (r20) running on BQ Ubuntu Edition. Issue: The time picker occupies the entire width of the alarm page and yet the actual dials occupy only a fraction of that width resulting in users accidentally changing other column values. May be we should increase the width of the dials? Thanks for taking the time to report this bug. Can you please be more specific about which text is too small in the new alarm screen? Thanks for taking a look at this so quickly and sorry for the incomplete description. The New Alarm page looks good but I keep adjusting both of the scroll wheels at the same time and the text for the Repeat, Label, and Sound are a bit too small. On the BQ phone there is still a third of a screen to work with and it seems it would be much easier to set up an alarm if more of the screen was used. I asked a co-worker to set an alarm and then asked his impression and his reply was that the scroll wheels could be bigger. Hi Mike, Thanks for the detailed description on the issue. 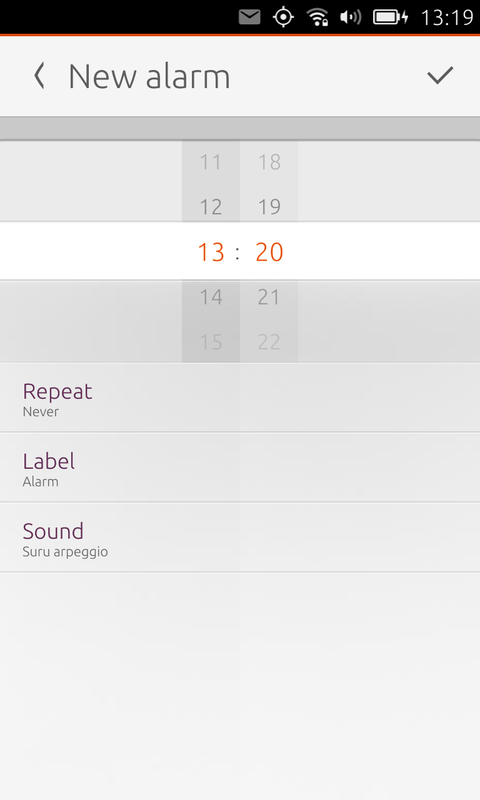 It seems during our user testing, testers found the font size to be too small in some areas of the clock app. We are tracking that at https://bugs.launchpad.net/ubuntu-clock-app/+bug/1432736. You also seem to be pointing at the scroll wheel (time picker) being small as well. Let's use this bug to track that issue. The time picker is a standard upstream SDK widget and so the fix should come from them. I will let the SDK team know and get this in their radar. summary: - text too small on New alarm screen. Time picker is being redesigned and prototyped. Hi Folks, first of all: Thanx to those who make this all happen! Just entering an "hh:mm" by typing 4 buttons on a numeric display will always be much faster than this way with the "rotating wheels".